Bull Kelp is the really weird looking sea weed you see floating in groups or “forests”as you paddle close to shore in the ocean. It often looks like a seals head or just small heads floating at the surface. Bull kelp is made up of four parts. The bulb that you see at the surface, holds gases that enable the plant to remain at the surface and get enough sunlight for the photosynthesis process.The flat blades streaming out from the bulb grow very long. The long stem reaching down to the ocean floor is called a stipe. There is a cluster of weeds at the bottom that attach to the rocks on the ocean floor . 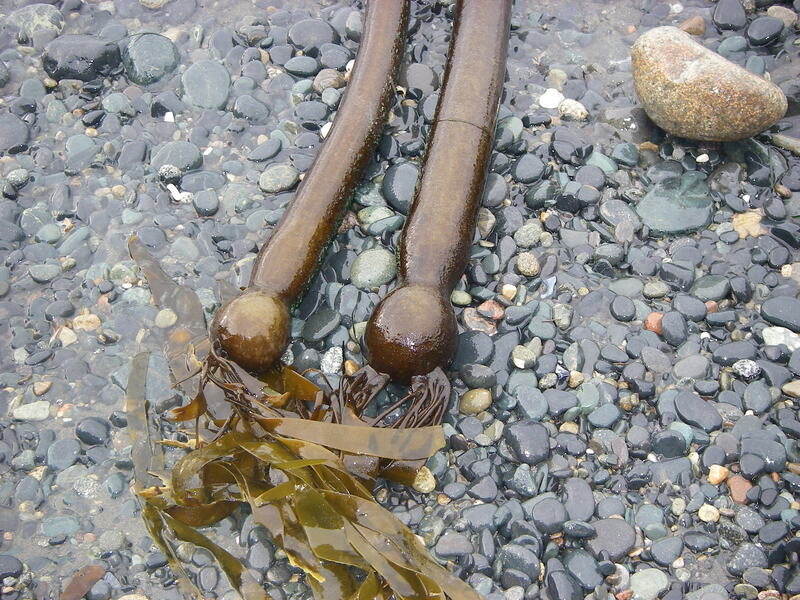 These are called a holdfast. Bull kelp is s a great resource for kayakers and for just about anyone for many reasons. We will give you 10 really neat ways to use Bull Kelp. 1. The blades of the bull kelp can be used to wrap your food in when cooking over a campfire. Your food will cook and will not get burned! 2. Kelp chips, salad seasoning, miso soup and sushi can all be made with the blades of the bull kelp. 3. The bulb part of the kelp can be used as a cup if you cut the blades and the stipe off of it. You could use the empty bulb to hold your spices in your camp kitchen. Cool! 4. The bulb can be carved like a jack o lantern with a face, nose and mouth. Keep a little of the blades for hair. Cute! 5. The stipe is often used by children on the beach as a whip-it for jumping over or as a toy to play with. 6 First nations people used a long strip cut from the stipe as a fishing line. Good idea! 7. The top end of the stipe can be used for a “bull” horn. Blow in one end like a musical instrument and it makes a great horn sound! Fun! 8. You can make wonderful decorative baskets out of the entire kelp plant. It is a bit technical but they turn out beautifully! 9. Kayaking in the kelp forest can be somewhat calmer on a rough water day. The kelp forest flattens the water. Just be careful not to get e kelp stuck across your bow. 10. If you are on a long paddle with no takeout spot and you are getting really tired a good resting place is to tie your kayak to several of the bull kelp using the deck rigging. Be sure the kelp you tie up to is still attached to the ocean floor. A good tug on it will let you know. You can eat or have a good rest attached to the kelp without drifting dangerously. You might even be able to catch 40 winks! We hope you try some of these interesting ways to use Bull Kelp. We would love to hear from you if you have a great idea we haven’t thought of!